Containers are becoming increasingly popular for both development and production, because they are portable, easy to use and consistent. In development, containers eliminate many of the technical issues seen when collaborating with team members across different platforms. And in production, containers require less management overhead and server resources when compared to bare metal or virtual machines. Bitnami makes it easy to use containers in development and production by offering open-source containers for commonly used languages and application frameworks. You can run Bitnami’s containers as Azure Container Instances (ACI), giving you a quick and easy way to combine all the benefits of containers with the power and flexibility of the Microsoft Azure cloud. 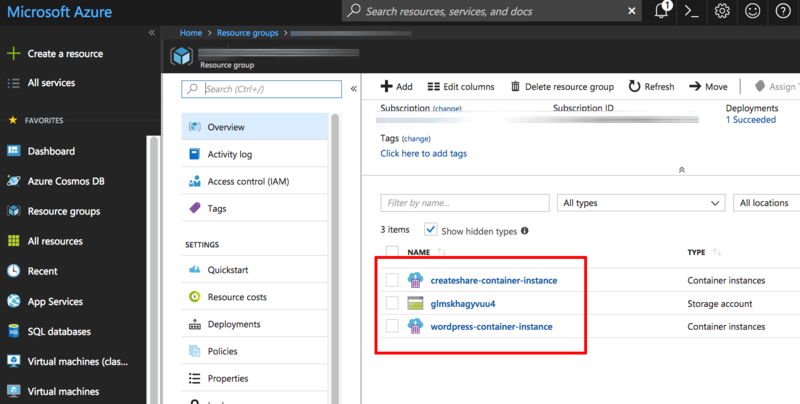 This guide walks you, step by step, through the process of deploying an application as an Azure Container Instance using a Bitnami container. At the end of this section, you will have deployed a Bitnami DokuWiki container using the Microsoft Azure CLI. 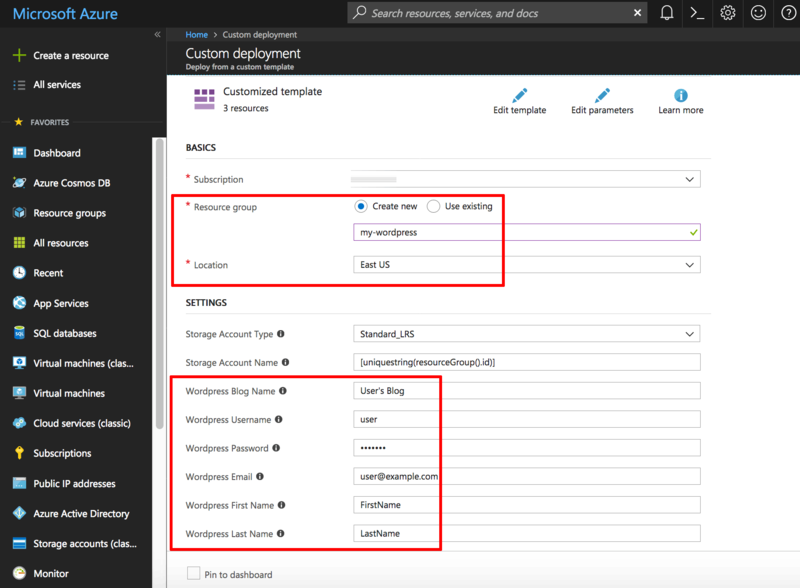 This section walks you through the process of deploying an application using a Bitnami container using az, the Microsoft Azure command-line interface (CLI). The example application used here is DokuWiki, an open source wiki application. 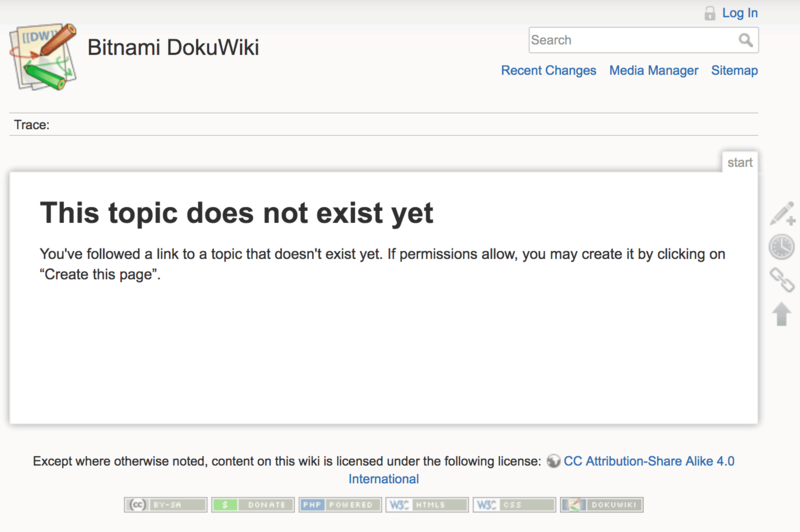 The steps described below will give you a pre-configured DokuWiki wiki that you can start using right away. But DokuWiki is just an example; there are many other Bitnami applications available as containers. You should see something like the image below. Note the value of the first key in the list. NOTE: Replace the KEY placeholder in subsequent commands with the key value obtained here. $ az storage share create --name dokuwiki-file-share --account-key "KEY" --account-name "dokuwikistorageaccount"
Navigate to the Microsoft Azure Marketplace, select the Bitnami Dokuwiki image and click “Subscribe”. NOTE: Remember to replace MY-REGISTRY placeholder with your registry name. DNS-NAME with a unique name (this will become the DNS name for your application), PASSWORD with a password for the DokuWiki administrator account, and MY-REGISTRY with the registry name you have created in previous step. The DokuWiki container will now be deployed and you should see an API response message like the one shown below. Pay special attention to the value of the fqdn field. At the end of this section, you will have deployed a Bitnami WordPress container group using a Bitnami ACI template. 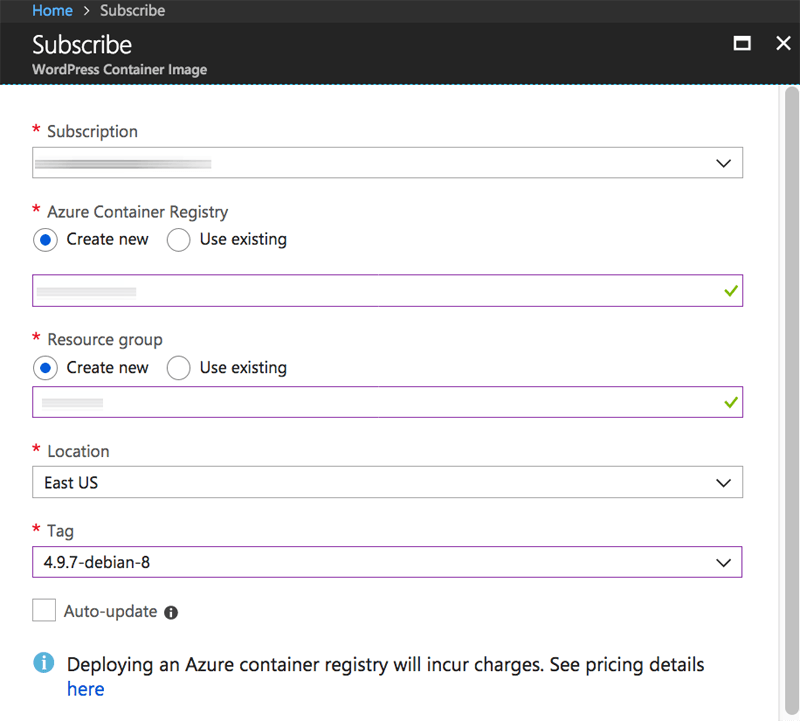 Azure also offers a way to deploy related containers in so-called “container groups”. This makes it easy, for example, to deploy an application container and its related database container together and have them pre-configured to talk to each other. An easy way to deploy container groups is with Bitnami’s ACI templates. These templates contain all the configuration and other information needed to deploy the containers and their related resources, making it quick and efficient to get started in just a few clicks. This section walks you through the process of deploying an application using a Bitnami ACI template. The example application used here is WordPress, although you can also find other applications in the Bitnami ACI template repository. You will be redirected to the Microsoft Azure portal. Log in if needed. In the “Basics” section, enter a name for the resource group and select the location. 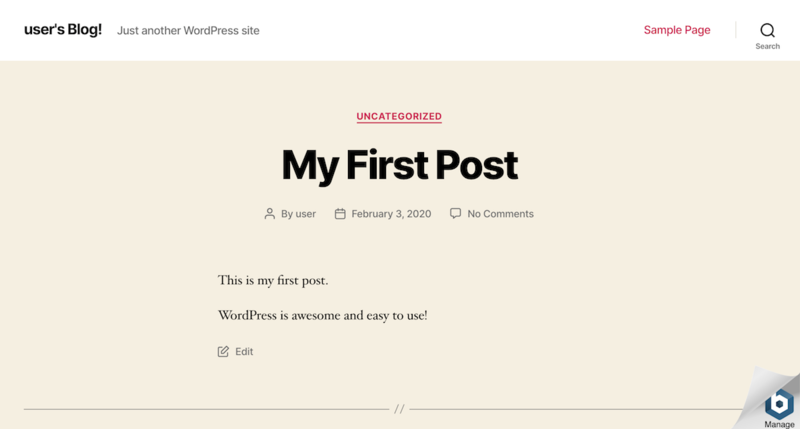 In the “Settings” section, update the values for the WordPress blog name, username, password, first name and last name. Other values can be left at their defaults. Agree to the terms and conditions and click the “Purchase” button. Your container group will now be deployed. This may take up to 15 minutes. 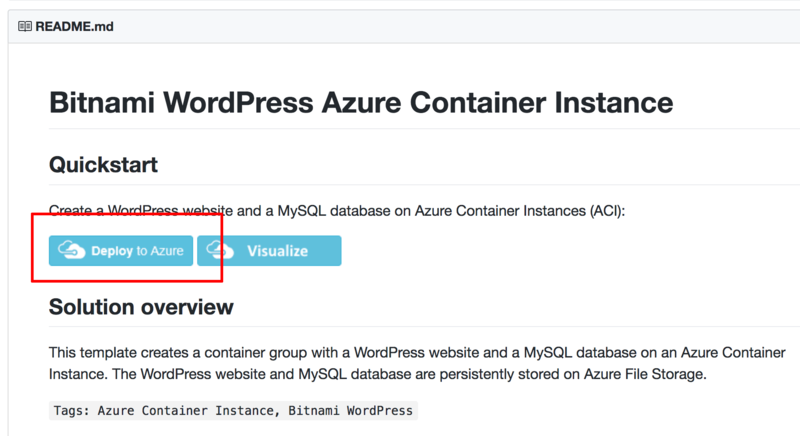 An Azure Container Instance to host the WordPress site and the MySQL database. 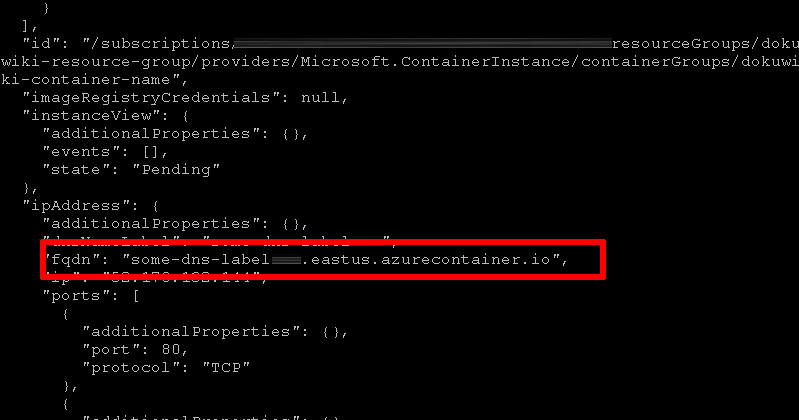 A run-once Azure Container Instance, where the az CLI is executed to create the file shares. A storage account for the Azure file shares to store the WordPress website content and MySQL database. Azure file shares to store the WordPress website content and the MySQL database. You should now be able to log in to the WordPress dashboard with the administrator credentials you created at deployment time. To delete the deployed container group, simply delete the corresponding resource group.